This year we’ve added some exciting new destinations to our already incredible list. These new venues are impressive in more ethan just their location, they are truly groundbreaking in their design and approach. These pioneering Eco Lodges allow the conservation minded traveller a truly unique and rewarding experience. Have a look on this page and see what you think. Super sustainable Pacuare Lodge in Costa Rica is a secluded luxury rainforest experience perched alongside one of the world’s most beautiful rivers. The very highest levels of comfort blend flawlessly with impressive core sustainability credentials. It is one of very few hotels in Costa Rica to have gained the country’s highest elite certification of sustainability, and this is woven into every aspect of the lodge. Strong programmes help support conservation and benefit nearby communities. The hotel has purchased 25,000 acres of primary rainforest along the Pacuare River both to protect the local ecosystem and to offset the atmospheric carbon created by vehicles. The end result is that all Pacuare Lodge tours are 100% carbon neutral. No trees were cut down to accommodate the 20 bungalows or main lodge, the lumbar was sustainably sourced and traditional thatch roofs were crafted by local Cabécar Indians. A very small amount of electricity is used at the lodge and even this is clean energy, generated by a turbine in a nearby stream. There’sbiodegradable soap and shampoo and the water for the showers is solar heated. Wastewater flows into state-of-the-art septic systems. All of the staff at Pacuare Lodge come from local communities. 95% of the rafting guides are from the closest city, Turrialba. 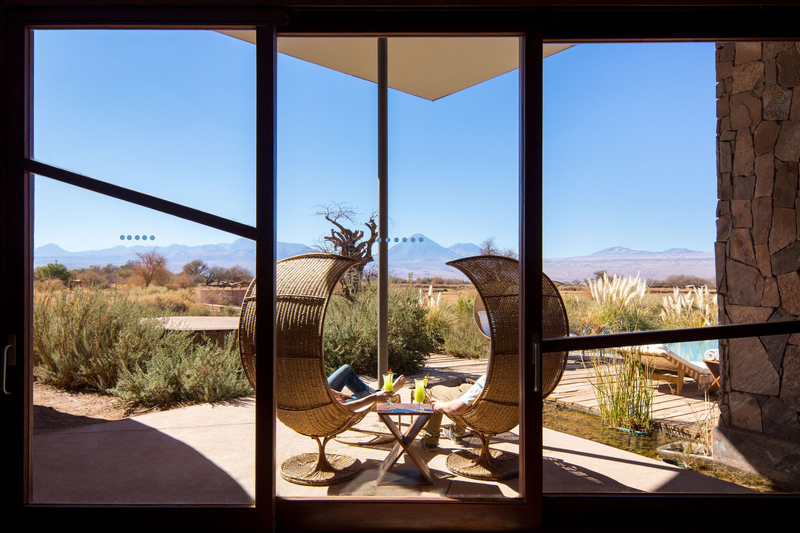 Tierra Atacama is family owned and operated Chilean hotel with inspiration for nature at its heart. Set in the heart of the Atacama desert, it is a hotbed of eco innovation and an example of how exceptional sustainability initiatives can evolve. Tierra Atacama was built to have the minimum impact on the local environment as possible. Before construction an archaeological study unearthed 400 pieces of pre-Hispanic material, which were donated to the Gustavo Le Paige Archaeological Museum, in San Pedro de Atacama. The hotel’s sustainability project has expended to be at the forefront of the renewable energy and water preservation movements in South America. In 2017 it became the first hotel in South America to become 100% solar-powered thanks to a hybrid system of photovoltaic panels, five invertors and a bank of high-efficiency, ion-lithium batteries. This system has so far outperformed the brief of meeting the hotel’s daily energy demand. The solar plant avoids burning more than 110,000 litres of diesel annually, reducing the carbon footprint of the hotel by 320-350 tons of CO₂ every year. 100% of the water at Tierra Atacama is extracted from the hotel’s own well, to avoid tapping into the supply for the local town. The water is then treated by a reverse osmosis plant and thanks to a NASA designed water system, all plastic bottles from the property have been eliminated, saving an amazing 41,000 bottles per year. Not bad for the driest environment on earth! Grey water from the onsite treatment plant is used for irrigation in the hotel’s gardens, transforming what had been abandoned land into gardens brimming with native species over six lush hectares and attracting bees and local birds. Tierra Atacama supports the dual education system at Likan Antai technical school and has taken on more than 40 young people as apprentices in the fields of tourism, electricity and agriculture. Many of them now work for Tierra Hotels. Hacienda Zuleta is a traditional, Ecuadorean working farm dating from the late 16th century. It’s belonged to the same family for the past 100 years, but the foundations of the sustainable community it is today were founded by Mr. Galo Plaza Lasso, a former president of Ecuador in the late 1940s. He loved the local indigenous way of life and the relationship between people and the land. Today the focus is still on ecological and cultural sustainability through The Galo Plaza Lasso Foundation which continues this work through diverse projects such as the Condor Huasi facilities, – a rehabilitation and breeding programme for critically endangered Andean condors – the Zuleta Embroidery Project, the Zuleta Library and a new project to study Zuleta’s population of spectacled or Andean bears. The goals are education, conservation, and development in partnership with the Zuleta community. The Hacienda is staffed almost entirely by local people and the community takes over the whole hacienda at festival time. It is very much a working farm with 300 cattle, 200 sheep and over 2000 hectares of pasture land and protected areas of native primary forest – much of the milk is used in Zuleta’s own cheese factory. The horse riding is outstanding. The Plaza family have a natural warmth and hospitality, everyone is a welcome guest in their country house, invited to share their life at an authentic hacienda in the Andes of Ecuador. Sacha Lodge is a 5,000 acre private reserve in the Ecuadorian Amazon, owned by an Ecuadorian family. It is a wildlife paradise that’s only accessible by river, offering a deep jungle programme to guests. Since its foundation in 1992, the motivation behind Sacha Lodge is to show it’s possible to sustain a healthy balance between economic development, rainforest conservation, local human advancement and respect to local culture. Since 1995 Sacha has invested heavily in acquiring land from neighbouring colonists – people who came from cities and relied on heavy farming and hunting to survive. Thanks to such efforts, Sacha has saved the primary forest from deforestation and is now the largest private reserve in the Ecuadorian rainforest. The perimeters are protected by a team of anti-poaching guards. In 2017 Sacha Lodge began a collaboration with the University of San Francisco in Quito and Manchester University to observe the behaviour of pygmy marmosets, a species of tiny monkeys, endangered by deforestation and the pet trade. The Lodge generates employment for over 60 families, who form a part of the Sacha team. Most employees come from local communities (the few exceptions being the administrator, chef and the bilingual guides), making Sacha the largest tourism-sector employer in Ecuador’s Amazon region. This brings direct economic benefits to the local community and a practical alternative to harmful activities such as logging and oil exploration. Additionally employees who work as native guides have the opportunity to share their ancestral knowledge and an incentive to continue passing it on to their children in a changing world. Sacha Lodge strives to make its practices as eco-friendly as possible. Guests receive reusable water bottles, all waste is sorted and separated before it goes inland to be recycled. It’s the hope of the owners of Sacha Lodge that future generations of both natives and visitors will be able to continue enjoying the wonders of the tropical rainforest. Estancia Huechahue – Lake District, Argentina. Cattle ranch Estancia Huechahue (pronounced “way-cha-way”) is remote and off-the-grid to its core. Nestling amongst the foothills of the Andes, east of San Martín, it offers just 10 rooms enjoying the best of Argentine hospitality and an experience of life on a real working farm in Northern Patagonia. In addition to superb excursions which include horse riding, fishing, rafting, bird watching and exploration of the history of the Mapuche Indians, guests will know they are staying at an almost entirely self-sufficient Estancia. It has always had to be this way, but each generation of the family has introduced new sustainable technologies, necessity being the mother of all invention! Water for irrigation and for use in the house is gravity-fed from natural springs. A limited amount of electricity is generated by a water driven turbine. The estancia encourages guests to be conscious of the amount of power and water they use. Estancia Huechahue is carbon neutral thanks to an on-going tree planting programme which also provides enough firewood for heating and hot water. Food wise, it’s a farm to table philosophy. All of the meat is home reared and the animals naturally grazed. There’s a dairy cow for milk and chickens for eggs. Pigs eat all the organic waste and in the winter their meat provides sausages, hams, and bacon. No fertilizers or pesticides are used on the estancia and there’s a large organic vegetable garden, extensive fruit and nut orchards. All surplus fruit is either dried in the sun, bottled or made into jam. The ranch employs local Gauchos and all the staff are very much aware of the fragile environment in which they live and work. The prevention of erosion is paramount, so walks and rides follow routes chosen for their soil stability. The estancia is currently in the process of reinforcing tracks which have begun to show evidence of deterioration. Bird watching is conducted in a non-intrusive manner and fishing is entirely on a catch and release basis. Caiman Ecological Refuge is an award winning 53,000 hectare wildlife reserve, ranch and lodge complex in the Pantanal. The current owner is committed to establishing Caiman as an eco-tourism model for the Pantanal, using African style safaris in a South American setting. Caiman is home to a number of ground-breaking wildlife conservation projects including the much lauded jaguar habituation programme Oncafari, the Blue Hyacinth Macaw project and the Blue Fronted Parrot Project – one of the species most affected by the illegal trafficking of animals. A 5,600 hectare protected nature reserve called the Private Reserve of Natural Patrimony (RPPN) Dona Aracy represents over 10% of the ranch’s total area. Guests stay in two exclusive ecolodges Cordilheira and Baiazinha and they can get involved with the various conservation projects running at Caiman. The Onçafari experience is unique in South America and offers visitors an opportunity to track jaguars using GPS tagging. The Environmental Interpretation Centre and all guests are given personal lectures on the unique Pantanal environment from expert guides. There’s a ranch-wide recycling programme and Caiman Ecological Refuge’s permanent residents’ community looks after both the lodge and the 180 ranch employees and their families. There’s a school, onsite dentist, doctor and environmental education project for children living on the ranch. In 2016 the BBC filmed an episode of premier wildlife TV series Natural World at Caiman. The show tracked the story of the first time orphaned baby jaguars had been successfully rewilded, anywhere in the world! Caiman recognises that the relationship between livestock and ecotourism has always been full of challenges, but seeks harmonious integration of livestock with the wildlife. The ranch also preserves the local cowboy culture and guests can see lasso competitions, drink tereré drink and see gauchos driving cattle across the ranch. Cristalino Lodge – Southern Amazon. Brazil. Cristanlino Lodge started life as a jungle camp created to capture and preserve the purity of the rainforest in an area where logging is a big industry. Today it has developed into a luxury eco-retreat deep in the heart of Brazil’s Southern Amazon. Located in 11,399 hectares of forest reserve in Brazil’s Mato Grosso region, the lodge is so remote it is only accessible by boat. Cristalino’s ethos is one of ecology and responsible tourism in harmony with comfort and sophistication. The area is inhabited by an exceptional number of species, even by Amazon standards, making this one of the Amazon’s richest places for observing birds, mammals, butterflies and orchids. It is a refuge for endangered species and is home to more than seven species of monkey, including the endemic white-whiskered spider monkey. The lodge offers some of the best wildlife experiences in Brazil, including viewing the forest from above the tree canopy thanks to two 50-metre observation towers and a wide range of outdoor activities such canoeing and hiking in the forest along 30kms (18.6-mile) of trails. Seasonal trails make the most of the changing seasons in the rainforest to allow guests to get really up-close and personal with the creatures of the Amazon. Water is sourced, purified and naturally treated on site and rooms are powered by 100% Cristalino solar power. Local produce is used to create the delicious food and juices. Cristalino has established a foundation dedicated to conservation, research and education. There are always academic researchers in the rainforest and Cristalino invites local school children into the reserve to enjoy “A Day in the Forest” and learn about their natural wildlife heritage. Cristalino Lodge is the winner of the Brazilian Luxury Travel Association’s Sustainable Vision Award 2018 for its strong efforts to protect the Amazon and promote environmental education. Ibitipoca is not just one of Brazil’s most beautiful hotels and an off-the-radar retreat for the rich and famous, it is also a leader in eco tourism, with plans to reintroduce, protect and breed endangered Atlantic Rainforest species on its reserve. These animals include critically endangered northern muriqui monkeys and maned wolves. Reserva do Ibitipoca is located beside Ibitipoca State Park in the south east of Minas Gerais state. It was created with the goal of securing ecological corridors to Ibitipoca State Park and the reserve now owns over 4,000 hectares of preserved land. Tourism arrived in 2008 thanks to the careful restoration of the original farmhouse dating from 1715, Pousada Fazenda do Engenho. This small boutique hotel helps to fund eco projects, develop the regional economy and better the lives of the local people through job creation and protection of the Mineiro culture. Reserva do Ibitipoca trains and employs people from the nearby community, especially women, to work at the reserva and gain their own financial independence. Marly the chef is a local lady who was trained by a professional French chef and now creates her own delicious blend of traditional Brazilian dishes and haute cuisine in the kitchens. A local young man called Junior showed great promise and so was sent to San Francisco to learn English. He’s now the Head Guide. A scheme for volunteers to come and stay at the reserva operates with the aim of sharing best ecotourism practises and acting as an example of how a low-impact, sustainable tourism can work. There are extensive organic gardens and all the fresh produce is grown on site, including the tea! Reserva do Ibitipoca offers exceptional comfort and high standards. Guests are immersed in authentic Brazilian history and can explore the reserve, with its art, wildlife, waterfalls and curious snow-white swathes of quartzite, on guided hikes or Mangalarga horses, electric mountain bikes and buggies. A daily yoga session is included, as are all walking tours. Best of all Ibitipoca has a cache of surprises to beguile their visitors!